Document: "A Guide to Municipal Tools Supporting Wildlife Species and Habitat Stewardship in Nova Scotia"
This 45 page document from April 2005 is intended to serve as a guide to municipalities and other interested groups and individuals who may be involved in the development or implementation of environmental initiatives that have benefits for wildlife and habitat conservation. This one page handout provides an overview of "The case for proactive consideration of wildlife and their habitat sin land use planning and development. Please feel free to print out and distribute. 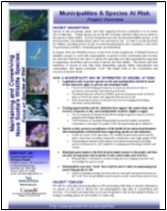 This document contains important information to accompany the NS DNR Significant Species and Habitats (Sighab) Database. To access the database see web link below. This one page handout is a brief summary of the project and has been distributed to municipalities and councilors to provide an overview of the project. 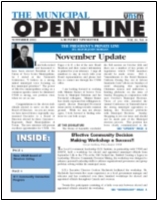 An article on the project was included in the November 2003 issue of the Union of Nova Scotia Municipalities (UNSM) newsletter "The Municipal Open Line". The article begins on page 2 of the newsletter. 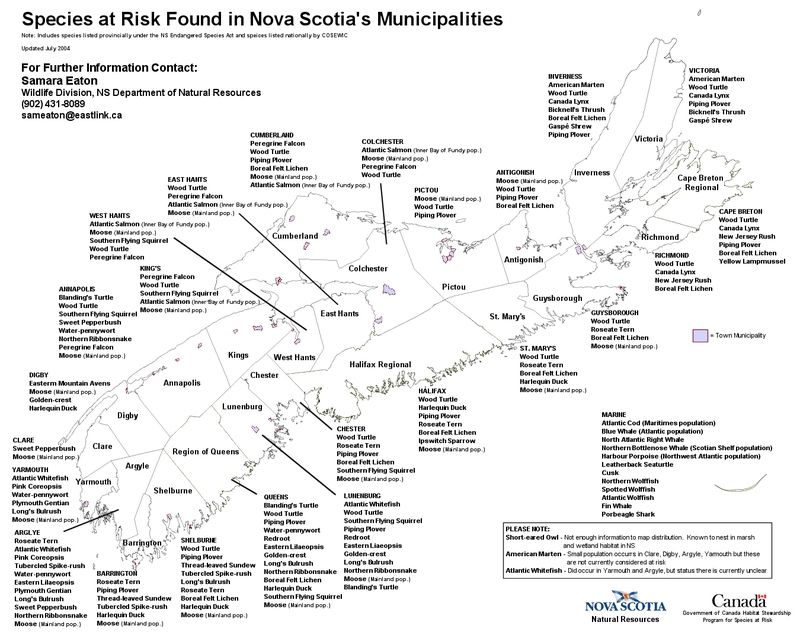 A map with species at risk listed for each municipality. Note that the lists contain species that are categorized as at risk either nationally or provincially. A spreadsheet with species at risk listed for each municipality. Note that the lists contain species that are categorized as at risk either nationally or provincially. 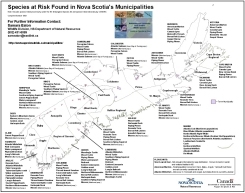 This power point presentation provides a basic overview of species at risk information for municipalities in NS. This presentation was circulated to all regional and rural municipalities. This is an example of the power point presentation given to regional and rural municipal councils in NS. It is a 10-15 minute presentation. The presentation is customized for each municipality (this is the presentation given to the Municipality of the County of Antigonish Council). This presentation is customized for the municipal planners in northern NS and Cape Breton Island. An online GIS mapping database with location information for significant wildlife species and habitat. The GIS files are now also available for downloading. This is sensitive information and therefore locations are only identified as polygons, not specific sites. Note: This information includes all Species at Risk and all species listed as Red and Yellow under the General Status Assessment process (see Status Assessment Page for explanation of these categories or the link below). 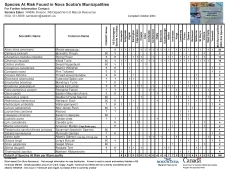 A thorough explanation of the General Status Assessment process in NS and a searchable database to examine the general status of all species in NS. All permits, licenses, approvals, registrations, and certification requirements organized according to provincial government departments. Information on species at risk in Canada, federal legislation pertaining to species at risk, a searchable database, funding opportunities descriptions, and more. The public registry for the federal Species at Risk Act (SARA) contains background and general information on the Act, the text of the full act, the species list, and more. Information on application process and deadlines, priority activities, and examples of projects funded in the past.